High performance anti-freeze products to keep your systems protected. Accepta’s advanced technology low temperature and frost protection chemical products have been developed for industrial, manufacturing and commercial applications where low temperatures and freezing conditions may present operational, engineering and health and safety problems. Our frost control and low temperature chemical products include high performance antifreeze solutions for industrial, commercial and food and beverage closed systems as well as uninhibited glycols. If you require uninhibited mono ethylene or mono propylene glycol then please contact us. Closed chiller systems operating in cold climates or during cold periods of the year may require an antifreeze added to the system water in the form of a glycol to prevent freezing of pipework and damage to the system. 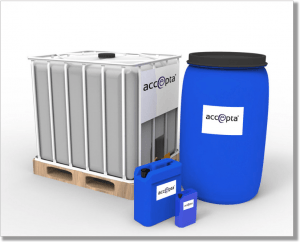 Accepta’s antifreeze products come with a blend of corrosion inhibitors for added protection and are available in the forms of Propolyne Glycol or Ethylene glycol. These work by lowering the freezing point of water within the closed circuit and will provide a high level of system protection when applied at the correct dosage rate. Our anti-freeze products not only protect again freezing but contain corrosion inhibitors and stabilisers for complete system protection. Whilst higher concentrations of glycol can have a biostatic effect, inhibiting the growth of microbes, lower concentrations can provide a nutrient source so it is generally recommended that a supplementary biocide such as Accepta 2827 is added to the system periodically to control the possibility of microbial growth. For advice on treating your closed chiller system contact us today.